Allow me to introduce myself. 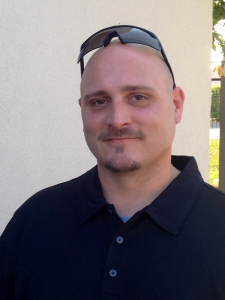 My name is Travis Lane and I’m the head geek here at Online Storage Auctions. I’m also a professional storage unit buyer, author and advocate for the industry. I’ve been referred to as the “Man Behind the Curtain,” but I assure you, I’m not quite that mysterious. I’m more like the man behind the “shower curtain” singing into a back scrubber! I recently received a request for an interview from one of the world’s leading news sites. I was really excited because it would have been some of the best publicity our site has had to date. They sent over a list of questions and I spent several hours over the weekend carefully crafting my answers. The next day, while my editor was proof reading the interview, I received an email notifying me that they had pulled the plug on the article. Just my luck! So, rather than all of this effort being in vain, I decided to publish the interview here. I hope you all enjoy it and if you have any questions or comments about storage unit auctions, you’ll have the opportunity to respond at the end of this article. I will do my best to reply as quickly as possible. Without further ado. How are actual storage auctions different than what’s portrayed on TV shows like “Storage Wars”? 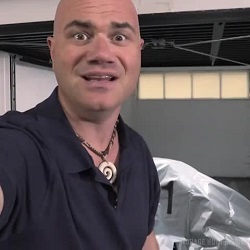 Storage auction reality shows are entertaining, but they don’t portray storage unit auctions accurately. The storage auction business, like most businesses, requires a lot of time and hard work to be successful. The reality shows make it seem like it’s as simple as buying a unit, finding a valuable item, having it appraised, then selling it quickly for an enormous profit. I assure you, it isn’t that easy. What you won’t see on storage auction reality TV is the countless hours that storage unit buyers spend finding and attending auctions, moving and sorting through merchandise, researching values, posting items on Craigslist & eBay and selling merchandise at garage sales, flea markets and resale shops. Lastly, drama, fights and arguments are almost nonexistent. What is usually found in a storage auction? Are valuable items common, or not really? Most storage units contain common household items, furniture, appliances, electronics, clothing, business equipment, etc. Not very exciting, but you can make money reselling this merchandise, especially in today’s economy. One thing I’ve learned over the years is that almost everything has value to someone. You would be amazed at what some people will buy. Now, I won’t tell you that you can’t find valuable items in storage units, it’s just not as common as seen on TV. So what’s been the coolest/most amazing thing found in a storage locker for an auction? There have been several amazing finds over the past few years. Three of the most notable would have to be Paris Hilton’s storage locker, which was purchased for $2,775 and reportedly resold for $10 Million, a locker purchased for $1,100 which contained $500,000 in Spanish coins and bullion and the locker rented by a retired Florida medical examiner which contained more than 100 human organs crudely preserved in soda cups and plastic food containers. I’ll never forget my best find. My wife was irritated, to say the least, by me spending $425 on a unit which didn’t appear to contain anything of value. After hours of work, we hadn’t found anything of considerable value. We were getting discouraged until, in the very back of the unit, we found an old safe. We took it to a locksmith and when he opened it, the safe was full. I opened a box and immediately got tunnel vision. Gold! The safe actually contained several boxes of gold & diamond jewelry, silver, a coin collection, a stamp collection and an antique revolver. I’ve been chasing that feeling ever since! When looking in a locker, have you ever found anything unusual? After you’ve been doing this a while, the lines between the usual and unusual become blurred. Some of the strangest lockers I’ve come across were owned by hoarders. I purchased a huge 10’x30′ locker for a few hundred dollars and it didn’t take long to realize that everything in it was either broken or had a part missing. Worse, there were multiples of everything. The owner of this locker literally never got rid of anything. I mean, who saves twenty broken broom handles? The unit I dubbed “The Trash Unit” was probably the worst. It contained dozens of filing cabinets, boxes, bags, desks and a couple of safes. I paid $600 for this unit because, understandably, I’m a sucker for safes. After a while, I noticed a theme to this unit. I opened a box and it was full of trash. I opened a bag, it was full of trash. Filing cabinets, desk drawers, trash. Opened the safes, and guess what was inside? Yep, more trash. Every crevice of this unit contained used paper products, food wrappers, pizza boxes and other types of trash that normal people would have discarded. Disgusting. I just barely made my money back by selling the filing cabinets, but it left a bad taste in my mouth for these types of units. If I see anything inside a unit which even resembles a hoarder unit, I avoid it like the plague. Have you ever seen lockers that people thought would be valuable really gone to bust? How about a seemingly not-valuable locker turn out to be a treasure trove? Sure, that’s the beauty of this business. You never really know what you’re going to get. I’ve purchased units for next to nothing and sold the contents for thousands. I’ve also paid top dollar for units and barely broke even. One particular unit that comes to mind had two large moving boxes labeled clothes. Auctioneer opened bidding at $5, so I decided to take a chance. Nobody else was interested. Turned out, the boxes did contain clothing; however, it was all designer clothing and shoes with the tags still on them. Probably 40 outfits in all. Lots of Gucci. I thought it was major score until my wife realized everything was her size. Oh well, easy come, easy go. At least I didn’t have to buy her clothes for a while. Another time, I paid over a grand for some high end furniture. I was certain that I could triple my money, only to find out that almost every piece was damaged. Luckily, I dodged that bullet. It took some time, but I eventually found a buyer who repaired furniture and he paid me what I had invested in the unit. Are you even allowed to enter/touch things before the auction? No, but that doesn’t stop people from doing it. It’s difficult for the auctioneer to see what people are doing when the crowd surrounds the unit. The auctioneer or facility staff will cut the lock, raise the door and allow everyone a few minutes to look. If you’re seen touching anything or entering the unit, you could get your bidding privileges revoked, or in extreme cases, banned permanently. Have there been any positive/negative effects of the sudden upswing of popularity of storage unit auctions? It all depends on who you ask. Storage facility owners, who in the past rarely recovered what the delinquent tenant owed in rent and fees, were loving it. Professional storage unit buyers, on the other hand, people who depend on these auctions to keep food on the table, were suddenly unable to make living due to the influx of new buyers and the high prices units were selling for. Luckily for us, the interest in storage unit auctions has been on the decline for some time now. This business will never be the same as it was, although, things are getting somewhat back to normal. Even though storage operators saw higher recovery rates, the massive turnouts at storage auctions have caused all sorts of problems for them. This led to innovations like online storage auctions which allow people to bid on storage units from home, work or on their mobile device. 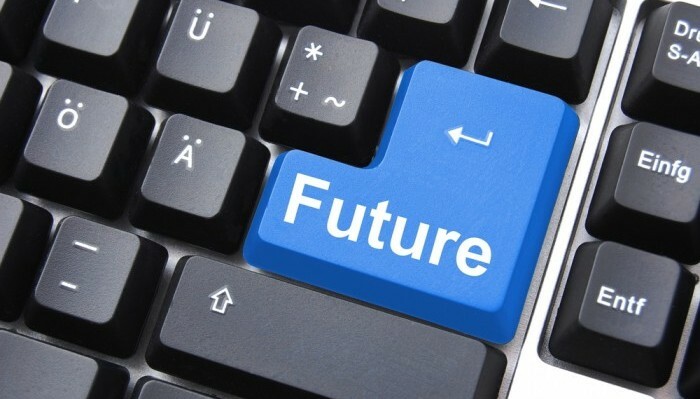 So far, the benefits of this new technology have been overwhelming for buyers and storage operators alike. Are there any dangers/things people can be unprepared for? One episode of a storage bidding TV show had wild animals run out of the unit, freaking people out. Was that just TV or does that actually happen? Well, I’ve never seen an animal, besides a rat, run out of a storage unit. Not to say that it couldn’t happen. Television shows have to be entertaining, otherwise they’ll be replaced with ones that are. Exploding meth labs, bidders arriving in tanks, fist fights, it’s all theatrics. There are dangers like extreme heat/cold, falling objects, heavy lifting, spiders, rats/feces and broken glass, but that’s just part of the job. What is the hardest item to resell in an auction? Are things like vehicles hard to resell or even get out of a storage unit? Storage unit buyers typically avoid units which contain a lot trash, clothing, old mattresses, dated or low quality furniture or heavy items with little value. Most vehicles sell, regardless of age or condition, because there is value in their parts or as scrap. Vehicles can be difficult to remove if they aren’t running and/or if they were maneuvered into tight spaces. What surprised you the most when you first attended these auctions? How much has it changed since then? I fell into this business by chance. I was helping a friend of mine clean out his storage unit when the facility manager drove up on her golf cart and invited us to the auction. I decided to give it a chance and when I arrived, there were only two bidders including myself. There were two storage units for sale and I bought both of them for next to nothing. The other person didn’t even bid. I remember asking myself, could it really be this easy? Turned out, situations like that were extremely uncommon, but it didn’t really matter at that point because I was hooked. I was one of the lucky ones who had a chance to experience storage unit auctions before they were thrust into the limelight by the storage auction reality shows. The difference between the business now and then is like night and day. Before the shows, storage unit auctions were relatively unheard of. You would see the same faces day after day. Prices were reasonable and people were making money. Post storage auction reality shows, 10 times more people and units were selling for double, even triple what they would normally sell for. This forced a lot of professional storage unit buyers to look for other ways to make a living. It was like a modern day gold rush, minus the gold. People came, realized that there isn’t treasure in every locker and gave up. Very few newcomers stuck with it. Gradually, things have gotten better. 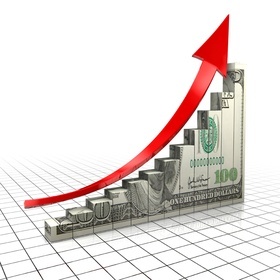 Attendance is down, prices have leveled out and people are making money again. I hope you enjoyed the Q & A. If you have any questions or comments about storage units auctions, feel free to leave your response in the comments section below. A storage auction business can’t get very far if you don’t know where to look for auctions. Word of mouth is helpful, but it won’t lead you to the most valuable auctions – those little-known gems without much competition and with plenty of potential treasures to choose from. These honey pots are the holy grail of storage auctions, but without a lot of research it can be hard to find them. That’s where storage auction listings come into play. A storage auction listing site is an aggregate of all the storage auction information for a given area. Some work on a national scale and others are more local, but all of them work to provide auction-hunters with a list of upcoming auctions so that you can build your game plan accordingly. Traditionally, these listing sites have been a little hit-or-miss. The problem is that a lot of the big sites just don’t go in-depth enough to be of much value. They’ll skim the surface, post a few of the easiest-to-find listings, and call it a day. That’s what puts StorageUnitAuctionList.com ahead of the pack: It’s a comprehensive listing of auctions all across the country, not just the highlights from a few areas. Nationwide, it provides listing information for more than 50,000 storage facilities, with a whopping 200,000 listings per month for all locations. And, unlike some sites, it updates daily to provide the most up-to-date information possible for its subscribers. That’s how Storage Unit Auction List became the #1 auction listing service in the country, and it’s why a subscription is one of the best things you can do for the long-term health of your storage auction business. Subscription prices for StorageUnitAuctionList.com vary depending on your zip code. In areas with more facilities and more results, you’ll pay more. Subscriptions start as low as $5 a month or $50 a year and go up from there – not a bad price considering how much time you’ll save using this service as opposed to tracking down all of the storage auctions in your area by hand. But we have a special offer that will sweeten the deal. Online Storage Auctions’ members who use our coupon code will receive a 15% discount on the cost of a subscription. This lets you check out all of the features without paying much upfront, and Storage Unit Auction List’s subscription guarantee ensures that you’ll be satisfied with the results or your money back. This is a limited time offer, so be sure to use our coupon code right away to take advantage of this great deal. 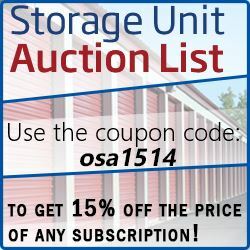 When you sign up for the service at StorageUnitAuctionList.com, type in coupon code “OSA1514” to receive your 15% discount or just click here and it’ll be applied directly to your purchase. You can use it for either a monthly or yearly subscription model – whichever you prefer! Of course, even the best national storage auction listing can still have some gaps in its information. If you happen to live in Texas, the biggest and best listing service for the state can be found at AuctionsTX.com. This offers the most in-depth coverage of storage auctions in five major Texas cities and their outlying areas, gleaned from local listings as well as direct listings from storage facilities themselves. 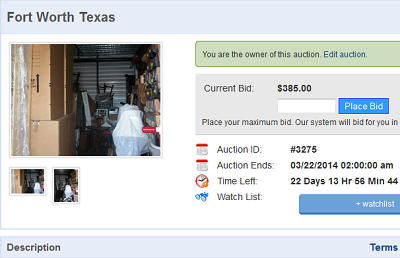 You won’t find a more comprehensive listing anywhere, so be sure to check it out for all of your Texas auction needs! For a free trial membership, click here. If you haven’t been paying attention to recent developments in the storage auction business, you might be losing money. Online storage auctions are a big trend, and they’re an attractive option for both buyers and sellers. While the benefits of convenience are obvious for auction-hunters, virtual auctions are also more valuable for storage facilities. 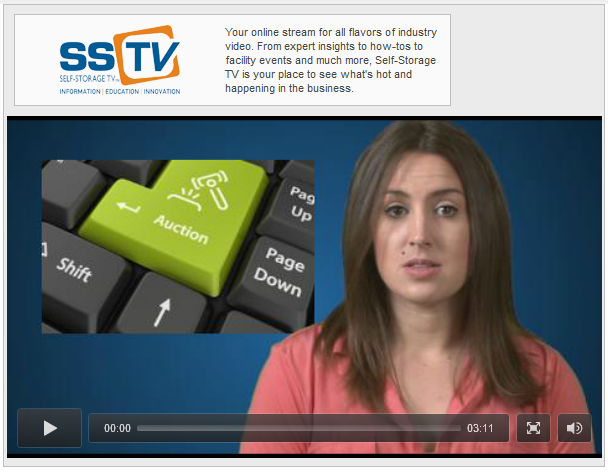 Auctions held online earn more on average than live auctions. Even if you’re already taking advantage of the benefits of virtual auctions, you could still be losing money by using the wrong service. People who use Storage Treasures and similar paid listing sites could net about 25% less than those who sell their units through the free service at OnlineStorageAuctions.com. When you use Online Storage Auctions, you don’t have to pay for a middle man. There are no fees for either the buyer or the seller, and payments are made directly to you by the buyer rather than being handled by the site. This means no credit card information is gathered and the winning bid is the same as what you’ll receive in your pocket. Storage Treasures and others of its kind, however, charge a premium either for listing an item or for winning it — or both. Since buyers know they’ll have to pay a premium on top of their winning bid, they’ll scale down their bidding. This essentially passes the cost of buyer’s fees back to the seller, who’s already paying fees for the privilege of having the item listed. Added together, this results in as much as 25% in lost revenue — and that’s assuming no additional costs like cancellation fees! 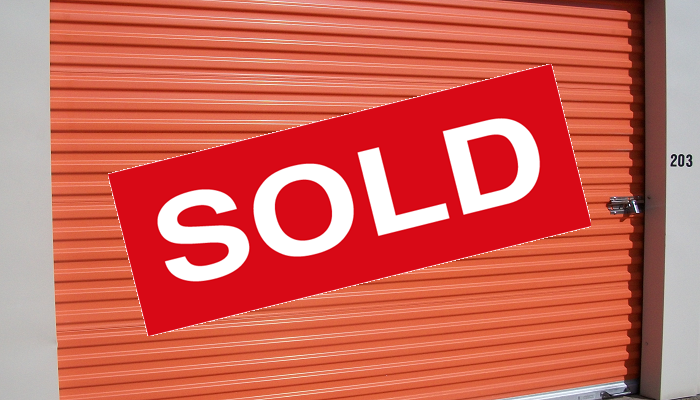 If you’re looking to sell the contents of a storage unit, wouldn’t you rather go with the option that cost you nothing? OnlineStorageAuctions.com is free for everyone from bidders to auctioneers to private sellers. Since there’s nothing to lose, why not give our service a try with your next sale? The foundation of a good storage auction business is your schedule. By knowing where you’re headed and when, you can plan an optimized route, budget for your auctions and arrange your buying schedule to fit in with the rest of your business activities. Building that schedule, however, can be a difficulty. With more than 1500 storage facilities in Fort Worth, Dallas and surrounding suburbs, there’s a lot of ground to cover. If you’re putting your auction schedule together by hand, keeping up with all of these facilities can be a time-consuming chore. Sitting down with a stack of local newspapers and a listing of facility websites isn’t a good use of your time, but you don’t want to miss out on a great auction by not being thorough in your search. There’s a better solution: Hire a pro to build your list for you. AuctionsTX.com is the most accurate storage auction schedule service for Texas. It encompasses five major cities, including Dallas/Fort Worth, and provides information for auctions and facilities of all sizes. Since many of the ads are placed directly by storage facilities, you know you’re getting the highest-quality information that your competitors may be unaware of. To use this info, you just need to download the list, choose your route and hit the road. Here is a small peek at the DFW storage auction schedule. Since the listings are located by a team of professionals rather than just aggregated from throughout the web, you’ll get much more thorough listings than any other service will provide. Membership costs just $12.99 per month or $89.99 for a full year. If you’re not sure whether to commit, you can start a seven-day free trial and decide from there whether the subscription is worth it for the time and effort you can save and put toward more lucrative parts of your business. You have nothing to lose! Click here for more information. Why Pay Storage Battles 25% When You Don’t Have To? If you’ve done any research into online storage auctions, you may know that storage units sold online tend to sell for more than their in-person counterparts. What you may not realize is that auctions held on OnlineStorageAuctions.com earn up to 25% more than auctions listed on competitor websites like StorageBattles.com. If you’re looking for a place to list your storage units for sale, wouldn’t you rather choose a site that will let you put more money in your pocket? Unlike Storage Battles and other similar listing sites, OnlineStorageAuctions.com doesn’t charge any fees. Our listing service is completely free. That means that there are no buyer’s premiums and no seller’s fees eating into your profits: Whatever is bid is the amount you receive. 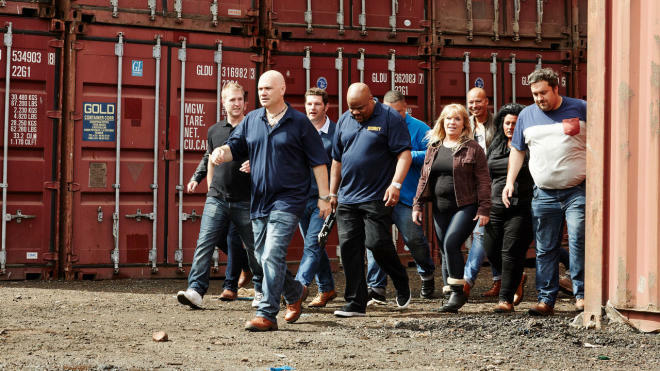 Storage Battles charges a 15% premium to the winning bidder. Since buyers take this fee into consideration, they scale down their bidding by 15% to make up for the cost. The seller is unknowingly paying the buyer’s fees. Worse, the seller has to pay an additional 10% in seller’s fees. Combined, this makes for 25% in lost revenue on every auction posted on StorageBattles.com. If that weren’t enough, Storage Battles charges a $20 cancellation fee per unit. No wonder some people are reluctant to sign up for online auctions! We do things differently at OnlineStorageAuctions.com. Our site is completely free, with no premiums charged to bidders, auctioneers, private sellers or storage facilities. So if you’ve been uneasy about trying an online auction service, consider giving us a try. Please leave your creative opinions in the comment box below. Before you can start searching for storage auctions in Dallas, you need to know where to look. Traditionally, auction hunters would find out about auctions through word-of-mouth and by researching local newspapers to put together a list of upcoming auctions. While this method still works, it can be very time-consuming, and you run the risk of missing out on a sale that was published in a different paper you didn’t think to grab. With so many storage facilities in Dallas, it’s easy to overlook all but the most well-advertised auctions. Of course, the problem with this is that these auctions are more likely to be crowded as everyone else will have come to the same place. Additionally, you’ll burn plenty of your valuable time by scouring the newspapers and websites for auction information. Every minute you spend on this research is time you can’t spend doing something more profitable, like selling your wares. Instead of spending your valuable time finding storage auctions, sign up for a service that will do the work for you. Several storage auction listing services exist, but AuctionsTX.com is the biggest and most valuable for people in the Dallas area. This site allows storage facilities to list their auctions directly, advertising to the people most interested in finding them. It also gathers storage auction information from other sources, like local media. Altogether, AuctionsTX represents the most comprehensive storage auction listing for Texas auctions. If you’re interested in trying it out, they offer a Free Trial. Plus, a monthly membership will only cost you $12.99 and can be canceled at any time. A year’s membership comes at the great value of $89.99. The money and heartache you save by letting a professional do the research for you is priceless.